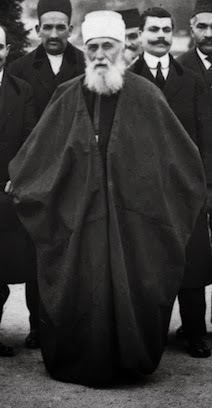 On 30 March ‘Abdu’l-Bahá, along with Siyyid Ahmad-i-Báqiroff, Mírzá Mahmúd, Siyyid Asadu’lláh and Ahmad Sohrab departed for Stuttgart. In a change, the Master told His companions to switch from Eastern clothing to Western and not to wear their fezzes. They reached Stuttgart at 8 p.m. on 1 April and proceeded directly from the train to the Hotel Marquardt. Before their arrival, ‘Abdu’l-Bahá told His attendants, ‘This is the best thing; we will arrive in Stuttgart, take our rooms in the hotel, settle down and call up the friends. How surprised they will be! Is this not a fine plan? We are going to surprise them. Then when they come they will find us in their midst, and knowing nothing about it at all. Yes! This is the best plan’. That same evening ‘Abdu’l-Bahá sent for Wilhelm Herrigel, Mr Eckstein and Alma Knobloch and arranged with them that the friends would be able to meet Him during the mornings while afternoons and evenings would be reserved for more formal meetings. During His first afternoon in Stuttgart, Mr Herrigel took the Master for a drive through the Royal Park. Later, ‘Abdu’l-Bahá had two meetings with the friends at Mr Herrigel’s home, and said, ‘How attracted and enkindled are the German Bahá’ís! How full of love they are! Love does not need a teacher’. One of the three dedicated Knobloch sisters, Alma Knobloch was destined to ‘take the Glad-Tidings of the Advent of Bahá’u’lláh to the soul of the German people’. ‘Abdu’l-Bahá had approved her going, to help Dr Edwin Fisher, an American dentist and the first Bahá’í in Germany, writing, ‘she must stay as long as possible’. Arriving in Stuttgart in 1907, Alma began to hold meetings and travel tirelessly to teach the Faith. Soon many young people in Stuttgart, Leipzig, Hamburg, and other cities, visited by Alma, arose . . . The Bahá’í Faith took root in the hearts of these religiously educated souls, and through the effort and constant study Local Spiritual Assemblies were formed in Stuttgart, Esslingen, Zeffenhausen, Leipzig, and Gera . . .The way was not always easy, and Alma, in her fine, soft voice and well-bred manner, fought many a mental battle . . . One could see the Bahá’í spirit at work in her, when some learned gentleman discussed, in not always a gentle way, the different aspects . . . Never once did Alma lose patience, and never once did she falter in her answers . . . When war was declared in 1914, Alma joined in the sufferings of her German brothers and sisters, descended into the damp cellars with them, hungered and froze with them, renounced her American citizenship . . . in order to be free to travel in the service of our beloved Master; and indeed, the need for spiritual food was great at that time. Many evenings at the fireside meetings, the spiritual food was the only kind of food the friends had that day. ‘Abdu’l-Bahá spoke highly of Alma Knobloch. When George Latimer was on pilgrimage in 1919, ‘Abdu’l-Bahá said of Alma, ‘Consider the power of God. Such a small woman! She is confirmed in service. She is greatly assisted. When a person compares her success with her physical body, a hundred people will not be so assisted as she – this woman is so short. That is why the confirmations of God are necessary . . . Miss Knobloch has attracted the people. There is a large man, Mr Herrigel, very large. She converted him’. In 1920 Alma returned to America, where she passed away in 1943.